Kelly recently interviewed Louise Hawes after reading and enjoying her book Black Pearls: A Faerie Strand (2008). You can read Kelly’s review here and learn more about Louise Hawes and her works in other genres at her website. Louise Hawes: Snow White was always a very special story for me. I think, even then, the idea of a large young girl and tiny men, that symbolic strength and significance of the feminine, made me feel I could accomplish anything. I still find this story is a very powerful, evocative lens through which to view gender — and hey, I like those odds, seven to one! As a teacher of writing, what advice would you give to a writer just starting out? Any specific advice on YA writing in particular? As the literary market gets tighter and harder, the best advice seems to be what it’s always been: write for yourself, not for your perceived notion of what will sell. If your book takes you on a journey you need, to grow spiritually and aesthetically, then others will find the trip worthwhile, too. As for YA literature in particular? Honestly, I never sit down and say to myself, “Now I’m going to write a YA book.” I simply go where I need to, where my issues are — and who doesn’t have a lot of issues around adolescence?!! 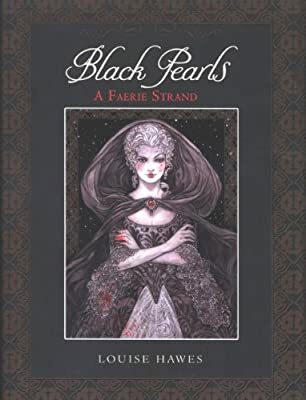 In Black Pearls, you retell classic fairy tales from new points of view, looking through the eyes of characters who are not the central figures in the original stories. Was there one “role,” one point of view, that you especially enjoyed slipping into? I particularly liked inhabiting the enchanted body but decidedly un-spelled mind of the magic harp in “Evelyn’s Song,” my version of Jack and the Beanstalk. Perhaps because I got to make this character up more or less from scratch, I felt more freedom to go where I was drawn. And that was to the personality of a feisty, resilient young woman whose need to be free shapes this whole tale from beginning to end. One thing I was struck by in Black Pearls: the ending of your Hansel and Gretel adaptation, “Mother Love.” I’ll try to avoid spoiling the story, but there’s a moment when Gretel’s father quietly doubts Gretel’s version of events, and right at that moment, I doubted it too! I wondered if maybe she’d spun a tale to avoid admitting a darker truth to herself. As the author, did you intend to have us question Gretel here? Because if you did, it certainly worked! Your response is interesting, Kelly, and I guess it’s a bi-product of my goal to have readers question point-of-view in general. In most of the tales, and you’ve singled out the moment in “Mother Love” where this happens, one or more of the characters refer to the frame tale, the original version of the story we all know. The characters often tell us that the old story has gotten their history wrong, that it is nothing more than gossip (literally, “an old wives’ tale”). In the scene you mention, just days after the event, what really happened at the witch’s cottage is dependent on who’s recounting it (and who’s listening). This is the same impression I hope you take away from the entire collection, the whole book. My re-imagined tales are meant to suggest that we are all the “main characters” of our own stories; that your good fortune can cause me endless grief, and course, the other way round, too. There is no “truth,” no fairy tale happy ending that ties up all the loose ends. There is only rich, roiling and confusing life seen through many pairs of eyes, felt by hearts beating in many different rhythms. What book most recently knocked your socks off, and why? I’ve been raving to everyone about Gary Schmidt’s novel, Trouble. It’s not fantasy, though Gary has done a fantastic version of Rumpelstiltskin (Straw into Gold). Few YA novels manage as expertly as Trouble does, to interweave and reconcile so many opposites: past and present, compassion and revenge, racism and acceptance, humor and grief. And Black Dog, the peanut-butter-eating, breaking-and-entering stray that joins the book’s plots and holds it together? I don’t think there’s ever been another literary canine as charming or incorrigible! Is there one question you always wish someone would ask you, but no one ever does? If so, what is it? And what’s the answer? What a great question! No one ever asks me for my National Book Award acceptance speech! (And you know every author has one ready : ) ) I won’t lay the whole, lengthy but glorious presentation on you now. But I will tell you that I intend to name at least three other authors (beyond my fellow nominees) whose books equally deserve the award. Publishing and awards are not an exact science; they’re more like the winds of chance, so if I get lucky, I want to bring some fellow writers along with me!